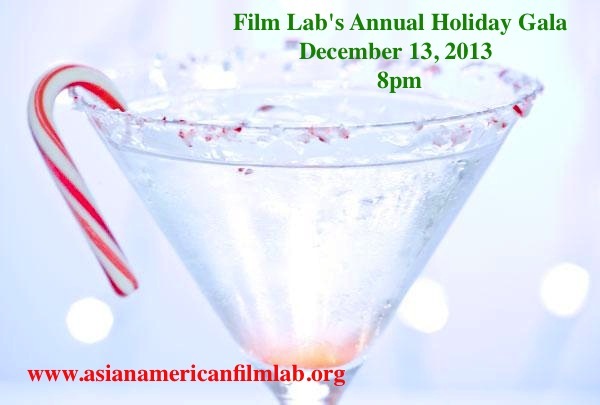 The Film Lab to Host 3rd Annual Holiday Gala! The Asian American Film Lab, a 501(c)(3) not for profit corporation dedicated to the promotion and support of gender and ethnic diversity in film and television will be hosting its 3rd annual Holiday Gala in New York City on December 13th. NEW YORK - Nov. 11, 2013 - PRLog -- The Asian American Film Lab (“Film Lab”) will be hosting its 3rd annual Holiday Gala fundraiser in New York City on December 13, 2013. The event will feature an open bar sponsored by TIFFIN (http://mantraamerica.com/tiffin.html), raffle and door prizes including coaching sessions with New York Casting Directors, live psychic readings by Julia Morgantini (http://www.bitwine.com/advisors/140321-julianyc), Secret Santa, and more! The Film Lab invites new and old friends to join them for this festive affair to celebrate the success of 2012 and toast to continued success in promoting and supporting ethnic and gender diversity in film and television in the New Year! To RSVP and for more information, please visit the Film Lab online at www.film-lab.org or via Eventbrite at https://filmlabholidaygala.eventbrite.com. The Asian American Film Lab (Film Lab) is a 501(c)(3) non-profit dedicated to the promotion and support of gender and ethnic diversity in film and television through free monthly educational and outreach programming and the acclaimed annual 72 Hour Shootout filmmaking competition (the “Shootout”). The Shootout, which has attracted celebrity judges such as hip hop icon Russell Simmons, ABC Executive Director of Primetime Casting Marci Phillips, playwright David Henry Hwang, and Producer Teddy Zee, among others, has inspired hundreds of filmmakers by helping nascent talent take brave steps towards a filmmaking career. The Film Lab was formed in 1998 by collaborative of New York-based screenwriters whose goals were to hone their craft and to share their knowledge, experience and resources. The membership has since grown to comprise professionals, artists and other talented individuals across the country who all share the common goal of creating great film and promoting all filmmakers of color, with a focus on Asian Americans, and the visibility of their stories and characters in film and television. The Film Lab offers free or de minimis monthly programs to the community, ranging from screenings to workshops to seminars. More information is available on their website, www.asianamericanfilmlab.org. The Film Lab is run under the direction of President Jennifer Betit Yen. The Unfinished Works program is coordinated through Lorna Nowve. Daniel Finley coordinates the Industry Spotlight Program. Aurora Betson, David Dennis, Daryl King, and Jodie Chiang all work in different divisions of the Connections program. Acting and Advisory Board members include Aaron Woolfolk, Eric Lin, Bea Soong, John Woo, Erik Lu, and James Kyson.